Best reading of the cycle in the short term suggests decline to 1.454 ended wave ((w)). Wave ((x)) bounce is unfolding as a double three structure where wave (w) ended at 1.476, wave (x) ended at 1.461, and wave (y) of ((x)) is proposed complete at 1.49. 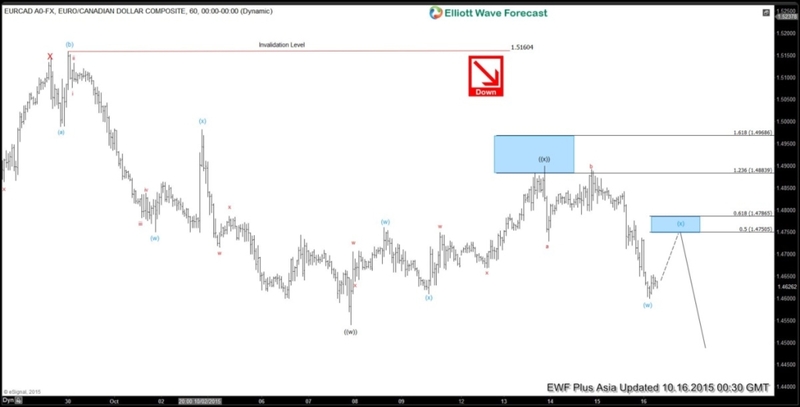 Near term, wave (w) low is proposed complete at 1.46 as a FLAT, and wave (x) bounce is in progress towards 1.475 – 1.478 area before turning lower. While wave (x) bounce fails below 1.49, or more importantly as far as pivot at 1.516 stays intact, the pair is expected to resume the decline lower. We don’t like buying the proposed wave (x) bounce.